As Groupon weighs a $5 billion+ acquisition offer from Google and LivingSocial is believed to be about get a $100 Million to $150 million cash infusion from Amazon, it is instructive to look at the difference between the two companies. 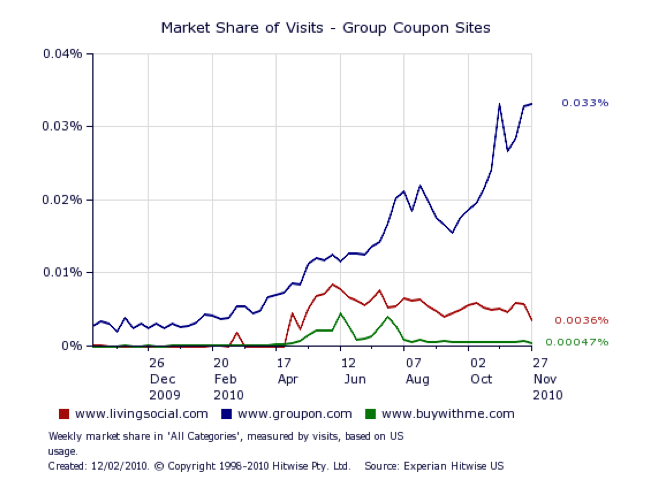 Hitwise looked at a 81 group-buying sites and came up with the chart above, which shows that Groupon commands 79 percent of U.S. visits to the group buying category, whereas No. 2 site LivingSocial only has an 8 percent share. This is what market leadership looks like, and explains why Google may be willing to overpay for Groupon. In general, the Internet coalesces around market leaders for different categories—the gorillas. And the gap between No. 1 and No. 2 is usually vast. It was true in auctions (eBay), e-commerce (Amazon), search (Google), and social networking (Facebook). And it will happen in social commerce as well. Although, earlier today, a LivingSocial executive noted at the SAI Ignition conference that LivingSocial is on track to do $500 million in revenues next year (it wasn’t clear if he was talking about the gross value of deals going through LivingSocial or the actual revenues that will be booked by LivingSocial—whereas Groupon will do well above $500 million in top-line revenues this year). What do you think? Will social commerce be yet another winner-take-most market? UPDATE: LivingSocial just confirmed a $175 million investment from Amazon.